On November 4, 2008, just shy of midnight, my friend Tiziano called me to say that his pride in America was so great that he was inspired to start the application process for his US citizenship the very next morning. Barack Obama had just been elected president. And Tiziano– an (until that defining moment) apolitical, non-patriotic fashion photographer who was born and raised in Italy and had been living and working in New York City for nearly 20 years– was in tears. Let me say here that neither Tiziano nor Bill are the kind of men I’d describe as being in touch with their feminine sides. And that is putting it mildly. They do not cry easily, and when they do it’s not something either of them would be inclined to brag about. To the contrary, they are old school men in the oldest Hollywood traditions: from character actor to leading man. In Tiziano’s case, his barrel chest, baritone that registers more like a lion’s growl than a human voice and weathered soul remind me of Stanley Kowalski. While Bill, a Daniel Craig lookalike with a real-life resume that actually rivals that of James Bond, has the charm, resourcefulness and humor of Crocodile Dundee. An ex-Special Forces military operator who literally loves his guns as much as he loves his country, Bill was the target demographic for Clint Eastwood’s Old Man and the Seat schtick at last week’s Republican National Convention. And yet, it was the lady in the pink brocade dress who blew him away on Tuesday night. The image of our First Lady in a Tracey Reece sleeveless sheath with a flared hemline in contrasting turquoise (Can we talk about the brilliance of choosing a garment that blended red & blue to such stunning effect in the midst of a political campaign that could make the Bloods and the Crips ask that we give peace a chance?!) was a Convention highlight for me. 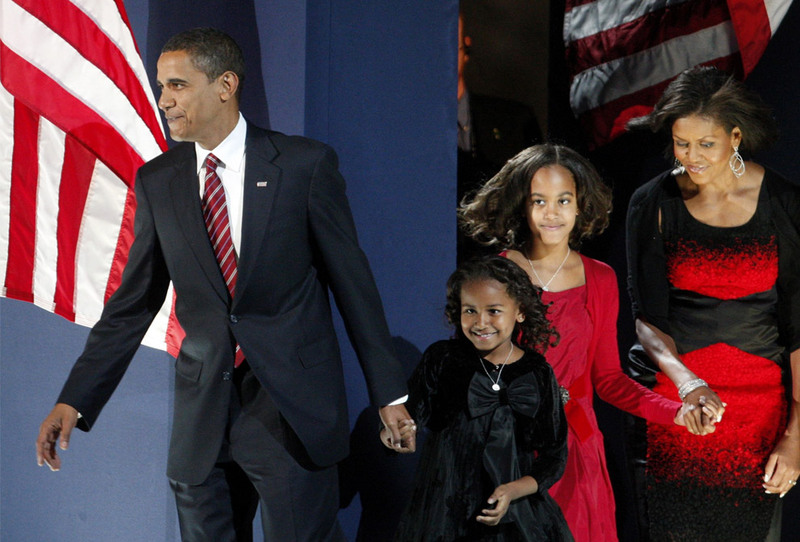 But, apart from her breath-of-fresh-air delivery, the other enduring impression from FLOTUS’s barnburner at the DNC was the picture of Malia and Sasha curled up with their daddy on a sofa in the Treaty Room of the White House as they watched the Mom-in-Chief speak her mind. As TV cameras on the floor of the TimeWarner Convention Center panned the crowd, I saw Malia’s (typically) nuanced expression– in this instance, a mix of wonder and respect– duplicated on the faces of delegates old enough to be her grandmother. In my own living room, a quick glance to my right confirmed that the look of profound and unabashed pride on my mother’s face was identical to that which radiated from the President’s. And the unbridled delight written all over Sasha’s sweet, little, dimpled face mirrored exactly what I was feeling in my heart as her mother spoke to all of us. That women, people of color, or any person who has ever felt marginalized due to economics, sexual orientation, immigrant status or physical disability might see themselves in our First Lady, and fall in love with her, came as no surprise to me. But when men like Tiziano and Bill– who by virtue of race, class and social status are expected to inherit the earth as a birthright– connect with an African-American woman to whom nothing in life was handed, that is a game changer. Speaking of which, my friend Bill just sent me a text stating: “BTW, changing from a Republican to a Democrat.” And something tells me Tiziano is just as fired up and ready to go, with or without his US citizenship, as any political junky this campaign season thanks to Michelle, Ma Belle. Or, should I say our belle? The morning after her triumph, my husband asked how I thought Michelle’s speech compared to that of Ann Romney’s at the RNC last week. I told him that as the women were as dissimilar as a paper doll and a living, breathing woman it would be unfair to compare them because Ann was not even in the same league as Michelle. Where Michelle’s spirit appears to have been burnished by a colorful (if not always rosy) and multi-faceted life; Ann’s appears to have been tarnished by politics. Where Michelle has covered tremendous ground from Chicago’s South Side to 1600 Pennsylvania Avenue; Ann’s trajectory seems more akin to that of a bonsai– with all of the attendant protection from the elements, pruning and clipping implied. And where Michelle’s riches are obviously borne of strong family ties, shared values with her husband and an attitude of gratitude and humility instilled by her mom and dad; I get the distinct impression that if Ann lost all of her money tomorrow she would have nothing, because she is emotionally bankrupt. To be fair, there is actually one arena in which the First Lady and her presumptive heir are equals, because both Michelle and Ann exude tremendous style. But as my friend Tiziano– who makes a very good living taking pictures of all of the beautiful people– can tell you: there is nothing more passé than style without substance. And We the People deserve so much more.